Albany’s roofing experts at Infinite Roofing & Construction know everything there is to know about roofing materials and roofing installation, with over 20 years in the industry. But it’s up to you to pick the right roofing material for your home. Here are pros and cons for the most common roofing materials, so you can make an educated and informed roofing decision. Asphalt Shingles are the most popular choice for roofs, and have been for awhile because of their combination of durability and affordability. These shingles are extremely heat resistant, water resistant, and easy to install, making them a great choice for roofing professionals and DIYers alike. Although asphalt roof shingles can last 20-25 years, that’s a relatively short lifespan compared to more sturdy roofing materials like metal or slate. Asphalt is also very welcoming to algae buildup, which can cause unsightly discoloration on your shingles. But with a little bleach and water, you’ll be able to keep the algae at bay for as long as you have asphalt shingles. Slate is a more sophisticated and upscale roofing option that looks great for larger, fancier homes, and it comes with a larger, fancier price tag, too. But many slate roofing tiles can last well over 100 years, making the initial investment a bit easier to bear. Coming in a variety of styles, slate roofing is extremely resistant to heat, fire, and water, and needs little to no maintenance to retain is natural and luxurious look. However, slate roofing is a not a job for the average DIYer. While they’re incredibly heavy, slate tiles are also easily breakable if your step on them—so leave the slate roofing installation for the experts. Metal roofing has been a trendy roofing material choice over the past decade or so, and for good reason. 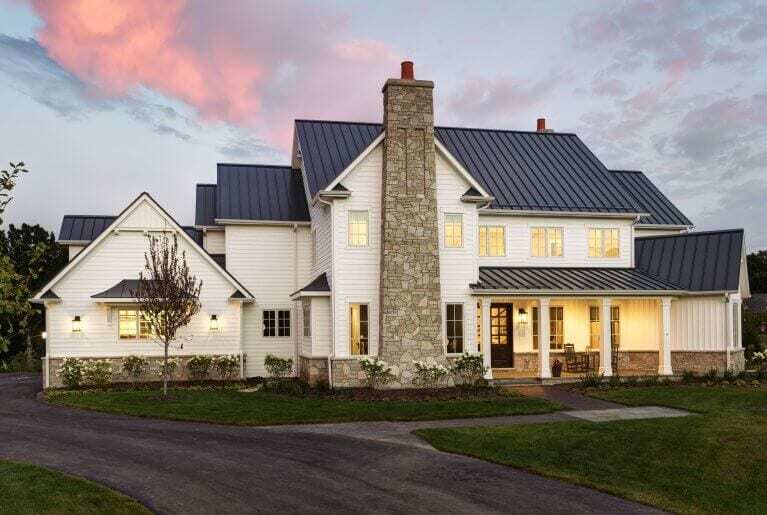 Metal shingles are nearly indestructible, lightweight, water resistant, and environmentally friendly, requiring very little maintenance during their lifetime. However, metal shingles will lose their shimmer over time, and can develop rust if not properly sealed upon installation. But for those who like a more rustic, natural look, a little rust and discoloration just adds to the character and charm of your roof. You’ll pay a heftier price for metal shingles than a standard asphalt shingle roof, and you’ll need a specialized metal roofer to tackle the installation. But if neither of these things are an obstacle, a metal roof could be an excellent addition to your home. Wood shakes are another environmentally friendly roofing choice, especially if they’re manufactured using recycled materials. Plus, they can give your home an earthy aesthetic that can’t be achieved with asphalt or other popular shingle materials. With a healthy amount of maintenance, wood shakes can last up to 30 years. However, if they’re not properly maintained, they’re susceptible to termite infestations, and dehydration that can leave your roof looking less like a wood roof and more like a haunted house roof. But for those who will put in the time to care for their roof, the beautiful, natural look and the eco-friendly nature of these shingles could very well be worth the money. You can check out our roofing services page for more details about replacement and metal roofs vs. asphalt shingle roofs! For all of your roofing needs, choose Infinite Roofing & Construction. We provide you with exceptional service and quality craftsmanship that makes the roofing experience simple and easy. Contact us to schedule a roofing replacement today! It’s interesting that you said that a roofer should use materials that are good for the environment. I also appreciate your comment about how metal and asphalt are good materials to use. My parents need a roof replacement since there’s now has a hole in it; they are looking for some skilled and qualified roofing contractors. For sure Ashley, it’s one of those areas where we find gets overlooked, the environmental aspect of the roofing materials used, since Asphalt is made of, well asphalt and doesn’t last nearly as long as the metal alternative. However, it can be tough to get around the difference in cost if the homeowner is only plans on living in the home for a decade or less, since the urgency of the investment is less. That being said, there is a rising trend in people opting towards metal roofs in areas that see a lot of wear-and-tear from weather.